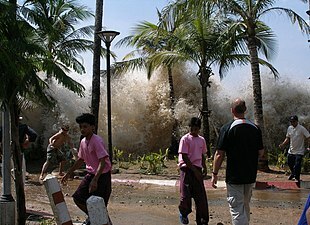 A tsunami (plural: tsunamis or tsunami; frae Japanese: 津波, lit. "harbour wave";) is a series o watter waves caused bi the displacement o a lairge volume o a body o watter, generally an ocean or a lairge loch. Yirdquauks, volcanic eruptions an ither unnerwatter explosions (includin detonations o unnerwatter nuclear devices), laundslides, glacier calvins, meteorite impacts an ither disturbances abuin or ablo watter aw hae the potential tae generate a tsunami. Unlik normal ocean waves, that are generatit bi wind, or tides, that are generatit bi the gravitational pull o the Muin an the Sun, a tsunami is generatit bi the displacement o watter. Tsunami waves dae nae resemmle normal unnersea currents or sea waves, acause their wavelenth is far langer. Raither than appearin as a brakkin wave, a tsunami mey insteid ineetially resemmle a fest risin tide, an for this raison thay are eften referred tae as tidal waves, awtho this uissage is nae favoured bi the scienteefic community acause tsunamis are nae tidal in naitur. Tsunamis generally consist o a series o waves, wi periods rangin frae meenits tae oors, arrivin in a sae-cried "internal wave train". Wave hichts o tens o metres can be generait bi lairge events. Awtho the impact o tsunamis is leemitit tae coastal auries, thair destructive pouer can be enormous an thay can affect entire ocean basins; the 2004 Indian Ocean tsunami wis amang the deidliest naitural disasters in human history, wi at least 230,000 fowk killed or missin in 14 kintras mairchin the Indian Ocean. Greek historian Thucydides suggestit in his late-5t century BC History o the Peloponnesian War, that tsunamis war relatit tae submarine yirdquauks, but the unnerstaundin o a tsunami's naitur remeened slim till the 20t century an muckle remeens unkent. Major auries o current resairch include tryin tae determine why some lairge yirdquauks dae nae generate tsunamis while ither smawer anes do; tryin tae accurately forecast the passage o tsunamis athort the oceans; an an aa tae forecast hou tsunami waves interact wi speceefic shorelines. ↑ Smid, T. C. (April 1970). 'Tsunamis' in Greek Literature. Greece & Rome. 17 (2nd ed.). pp. 100–104. This page wis last eeditit on 14 Apryle 2018, at 16:53.